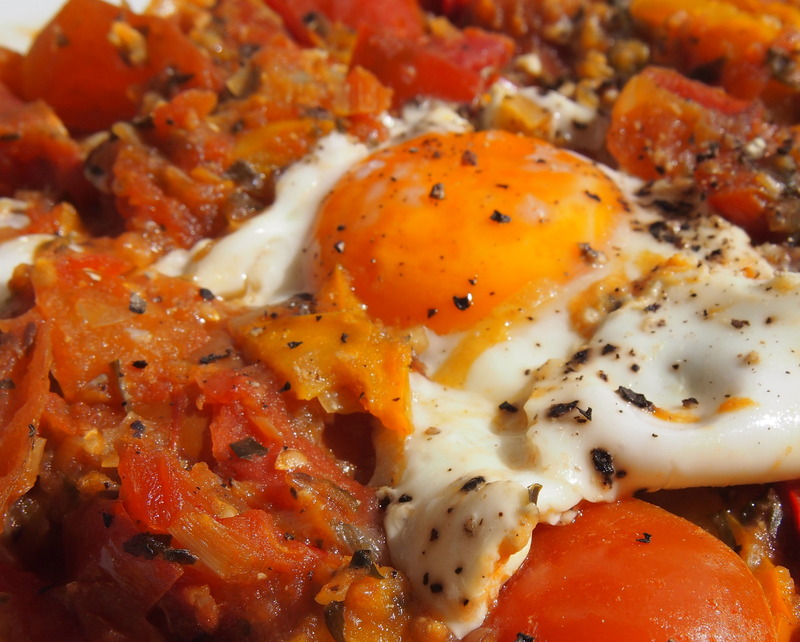 In North Africa, it is called shakshuka – which literally mean mixture in Arabic. Basically, it is eggs poached in a mildly spicy sauce made from slow-cooked leek, bell peppers, garlic and tomatoes, spiced up with saffron, cumin and cayenne. It is a bit laborious, but you can prepare it well in advance and keep it in the fridge until the mobile calorie intake unit friends show up for duty. In any case, it is the perfect dish for a brunch, packed with flavours, sweet and savoury at the same time… Just serve with bread. Note: the onions were replaced for leeks, as one of the mobile calorie intake unit is allergic to onions. In a very large pan dry-roast the cumin seeds on a high heat for 2 minutes. Add the oil and onions and sauté for 5 minutes. Add the peppers, sugar and herbs and continue cooking on a high heat for 5-10 minutes to get a nice colour. Add the tomatoes, saffron, cayenne and some salt and pepper. Reduce the heat to low and cook for 15 minutes. During the cooking keep adding water so that the mix has a pasta sauce consistency. Remember to taste and adjust the seasoning as you go. Remove from the heat, remove the bay leafs and transfer to a a large bowl. Set aside. The vegetabe mix can be prepared well in advance, and kept in the fridge. “Oh” said the mobile calorie intake unit my friend. “You made tortilla for brunch?”. “No, I haven’t”, I answered. “This is a frittata”. “Like an omelette?” asked a confused mobile calorie intake unit friend. 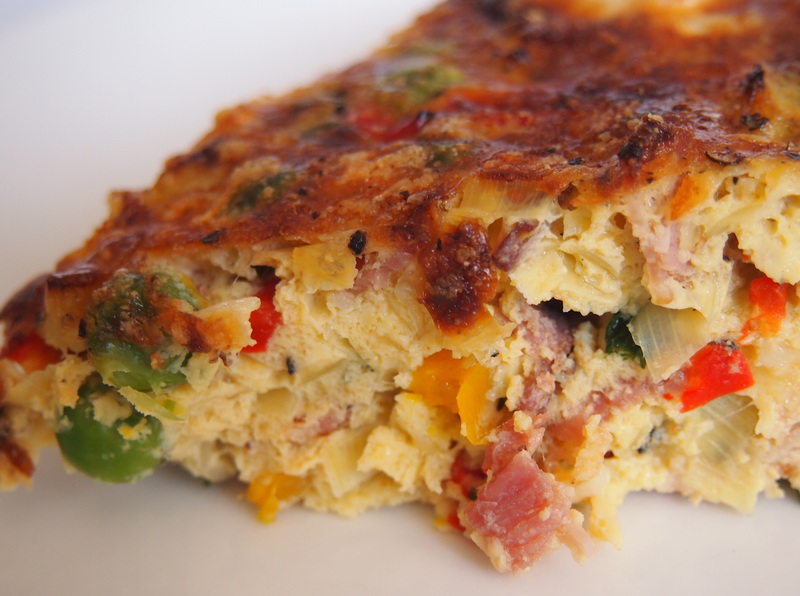 “No, no….” was the only possible answer “It is a frittata… just eat it, will you?”. Thankfully, he did. Otherwise I would have to start a lenghty on the specifics of omelettes, tortillas and frittatas. A tortilla can never be baked and it is always done in a two step process (indeed a process, until you learn how to turn it around without a mess of epic proportions). An omelette is normally made with 2 or 3 eggs and folded. A frittata is baked – or fried and baked… And, let’s not forget tortillas are Spanish, omelettes are French and frittatas are Italian. But, all of them, a perfect dish for a festive brunch. Preheat the oven to 180oC oven and the grill on its highest setting. Heat oil in a non stick ovenproof large frying pan over medium-high heat. Fry the bacon for 2-3min. Add the red pepper. Continue to cook for another few minutes until the bacon is golden brown and crisp. Add the leeks, and let it sweat until everything is tender. Toss in the peas and cook for another minute or two, then add the basil roughly missing. Cut the goat’s cheese in chunks and scatter half of it over the top. Break the eggs into a large bowl and beat them. Add the parmesan cheese. Season with lots of black pepper. Poor the beaten eggs over the vegetables and gently shake over medium heat. As the omelette begins to set at the bottom, grate the remaining goat’s cheese on top and season with pepper. Place the plan under the hot grill in the oven for a few minutes until cooked through and golden on top. Start to making the Szechuan salt, by crushing the the peppers with a mortar and pestle together with a teaspoon of salt. Whisk the eggs with a pinch of sea salt and freshly ground black pepper until smooth. Heat 1 tablespoon of oil in a non-stick wok over medium-high heat. Add the egg mixture and swirl the pan on the heat for 30 seconds, or until browned around the edges, but still liquid in the center. Transfer to a large bowl. Heat the remaining oil in the wok. Add the spring onion and the garlic. Stir fry for 30 seconds or until softened. Add the tomatoes and the sugar and cook, stirring occasionally, unit softened but still whole. Return the eggs to the wok and fold gently until set. Remove from the heat and leave to rest for a few seconds. Sprinkle with the Szechuan salt. Serve with white boiled rice and green leafy vegetables. 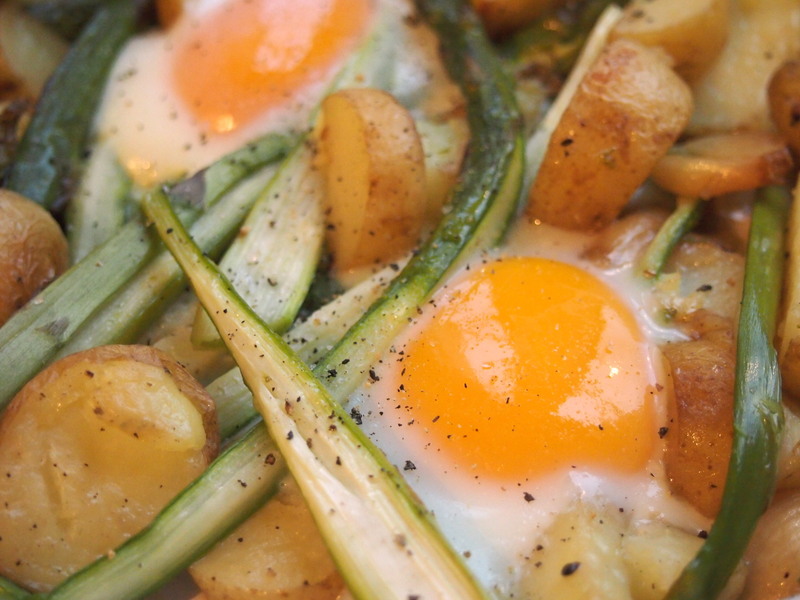 The day cannot go wrong if you have this for brunch – this is a real feel good dish. Mint and peas are one of the finest flavour combinations, and so is eggs and feta… And it feels like spring is right here. Cook the peas following the instructions in the package. Mix the eggs with a whisker and season with salt and freshly ground pepper. Put enough olive oil to coat the bottom a medium size frying pan, and place it over medium heat until it is piping hot. Lower the heat and pour the eggs in the frying pan. When they begin to set, use a wooden spoon to draw the cooked eggs to the center. Do this several times until all the uncooked egg is set. 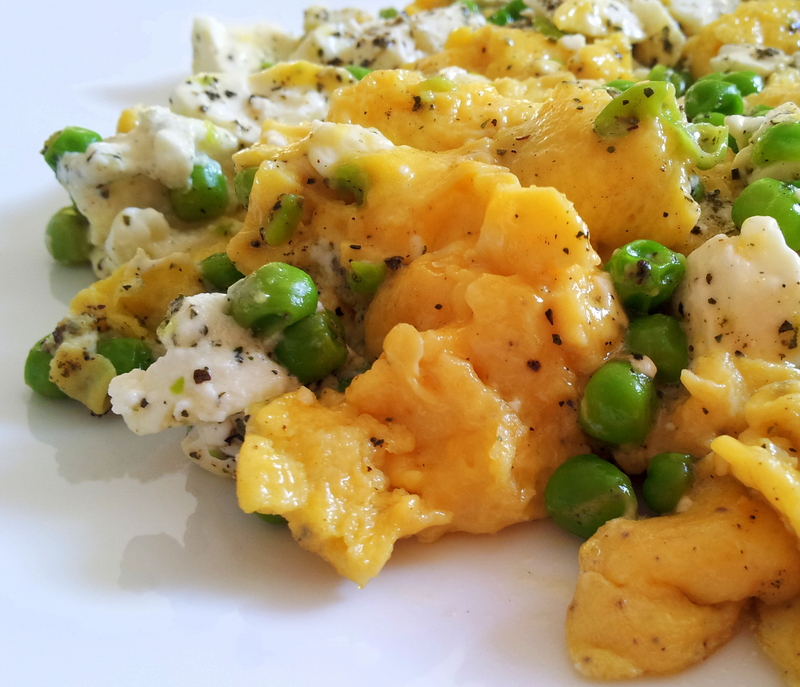 Scatter the peas and feta over the set eggs and cook for another 3 minutes until the feta starts to melt. Transfer the scrambled eggs to a plate. Said it once: I don’t even like asparagus… But, it just seems right to test the The 10 best asparagus recipes from The Guardian one by one. This one is very easy, very tasty and very filling. Just the kind of stuff you want to eat over lunch with shredded chicken or a bit of rice, if you are feeling vegetarian. For the benefit of the bikini season, I have omitted the butter the original recipe called for. It is not as creamy, but still delicious. Preheat the oven to 200 oC. Wash and drain the asparagus thoroughly. Simmer for 5 minutes in boiling water and drain. Pat dry with kitchen paper and arrange in a large, greased oven proof dish. 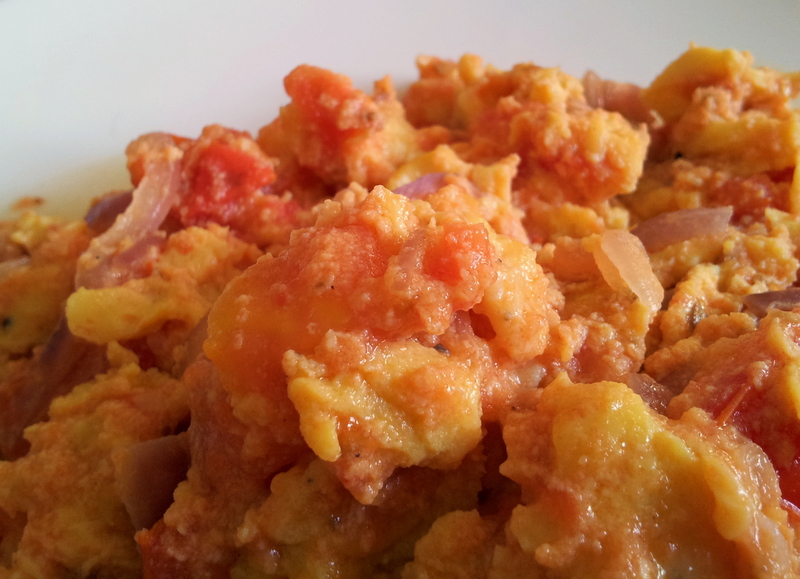 In a small bowl, mix together thoroughly the sour cream or yoghurt, flour, egg yolk, salt, paprika and sugar. Pour this evenly over the asparagus. Sprinkle the breadcrumbs over the top and then dot with small knobs of the butter. Bake in the oven for about 15 minutes or until the top is golden. Summer is apparently today, with a whooping 23 oC expected… And, oh praise the Lord!, it is a not a weekday! Before rushing to the lake, my favourite recipe for this season… Have already done it several times this “spring”- not minor thing, considering I have a childhood trauma related to asparagus (swallowed hairpin, please ask my mother for details). Heat the oven to 190 oC. Put the potatoes into a roasting dish with the garlic. Sprinkle over the oil, add plenty of salt and pepper, toss and roast for 30 minutes, until tender. Meanwhile, snap the woody ends off the asparagus and cut the spears into 3-4cm lengths. When the potatoes are tender, add the spears, toss and roast for 15 minutes more, until the asparagus is tender. Now create four little spaces among the veg for the eggs, arranging the potatoes and asparagus pieces into holes more or less stable. Working quickly, so everything stays hot, break an egg into each space, then return the dish to the oven for about four minutes, until the whites are set and the yolks still runny. Sprinkle some salt and pepper over the eggs, serve. Pain perdu literally means “lost bread” in French. As in the bread which you cannot eat while french and becomes stale. Probably during Roman times, a resourceful cook realized that if the bread was softened by dipping it in milk and/or eggs and then fried, it could be converted it into a delicious dish apt for all tastes. I grew up in Portugal eating it, as fatias douradas [golden slices] over Christmas, generously sprinkled with sugar and cinnamon. When I moved to Spain, I learnt their name was in fact torrijas and it would make its appearance later down the year during Lent. I am pretty sure if I bring this topic up in the office, Swiss and the Germans would claim to have their own variety of the dish. But, that belongs to another post… To close the debate, it might be worthwhile mentioning there is a considerable difference between fatias douradas, torrijas and pain perdu. 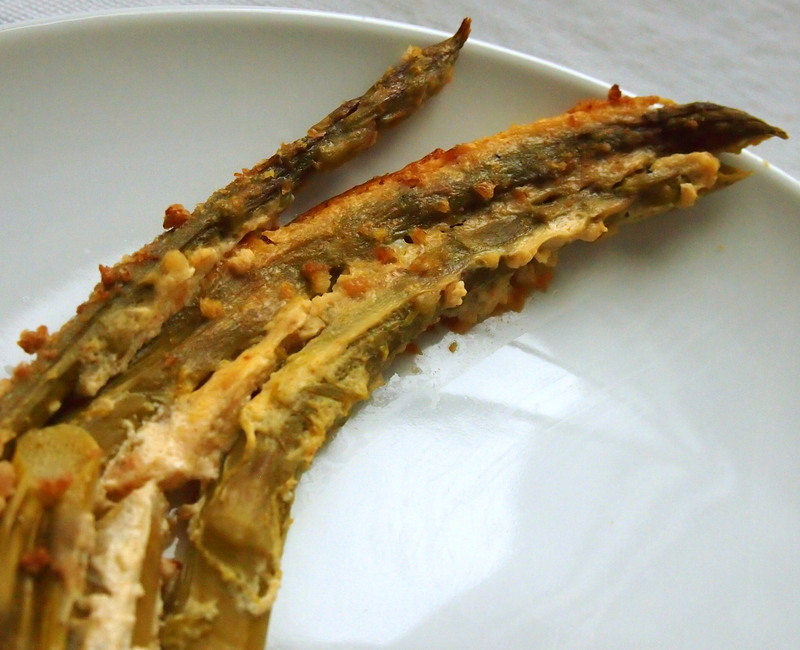 The iberian varieties are deep fried, while the French opt for browning them with butter. In any case, when I found an ancient panettone in the back of the cupboard, I remembered this recipe I had seen ages ago in a Gordon Ramsay’s book. It also had been a while ever since I used this book, and in fact, I even had a perfect group of [s]suffering guests[/s] testers coming home for brunch. Perfect occasion, perfect ingredients, perfect guests… As every Gordon’s recipe, if you follow the instructions to the letter, you will get exactly what you are supposed to get. Probably due to the differences in the ingredients, the raspberry mix got a bit messy, but nothing a pair of experienced hands couldn’t fix to the right consistency and taste. All in all, in almost less time than it took to cook it, not only I managed to get rid of old panettone but also had a very happy and satisfied crowd. Definitely calories worthwhile taking. 1. Put the ricotta, mascarpone, sugar and lemon juice in a bowl and mix until it is smooth. Fold half the raspberries and mix softly. 2. Put 1 slice of panettone in the egg mix and let it soak for a couple of minutes. 3. Fry the slice on both sides until golden brown (about a couple of minutes). Take it out of the pan and put it in a serving plate. 5. 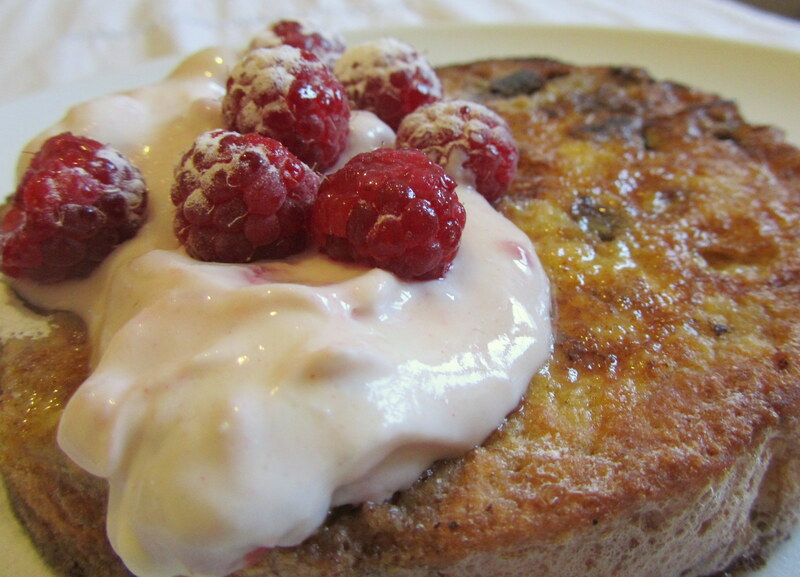 Put a generous spoon of the raspberry mix on top of the warm slices of fried panettone, and finish with the remaining raspberries. 2. Melt the butter in a non stick pan until it begins to foam.